Optimal Service life — Service life of 960,000 kilometers/12,000 hours/ 6 years with no Extender needed. Excellent Protection — Excellent protection against pitting, corrosion and erosion even on hard to protect metals like aluminum. 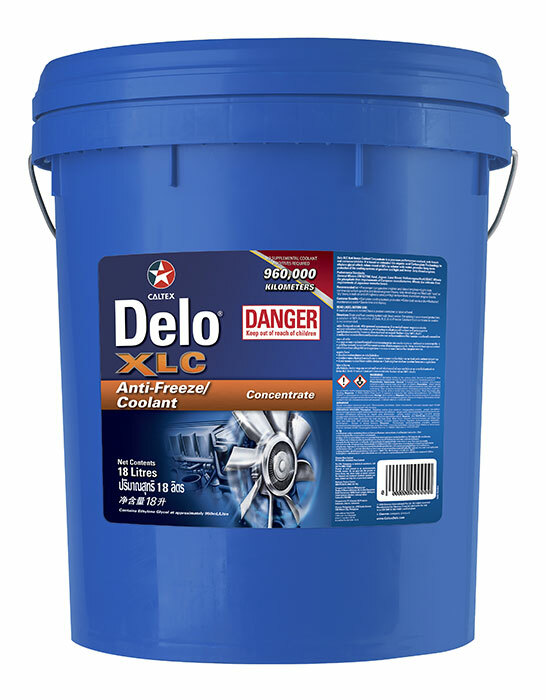 Delo XLC Antifreeze/Coolant is a heavy-duty, ethylene glycol based engine coolant which incorporates patented organic corrosion inhibitor technology called aliphatic carboxylates. Delo XLC is a nitrite, nitrate, borate, phosphate, silicate, and aminefree formulation that provides maximum protection of the six basic metal alloys found in most heat transfer systems. Delo XLC products do not contain phosphates or silicates which are known to contribute to hard water scale issues. Delo XLC promotes maximum water pump seal life by eliminating inorganic corrosion inhibitors. Delo XLC has a recommended service life of 960,000 kilometers/12,000 hours/ 6 years. This product will not require the addition of SCA’s to achieve its recommended service life. Routine visual inspections, coolant top-off and annual testing are recommended to ensure maximum service life. Heavy duty engines regardless of fuel type or environmental controls being used where the OEM recommends a nitrite free, silicate free coolant. Mixed fleets where automobiles, light duty trucks and heavy duty trucks are being serviced and the OEM recommends a nitrite free, silicate free product. Recreational vehicles where a nitrite free, silicate free product is recommended.